We have been occupying empty blocks on the Aylesbury Estate since the March for Homes on Saturday 31st January. 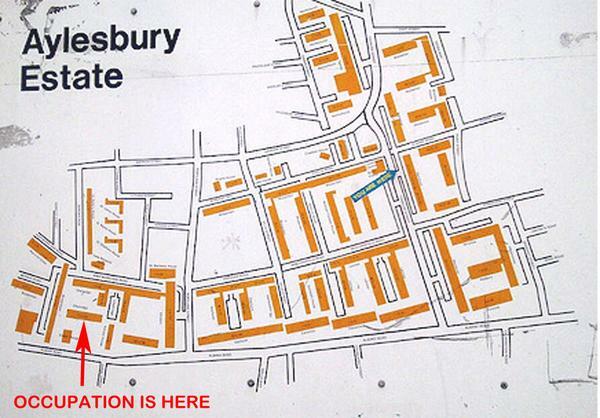 We are now in our third occupation – of Chiltern House, on the corner of Albany Road and Portland Street, SE17 – where we are occupying the former offices of Southwark Council’s Regeneration and Planning departments, as well as some of the empty flats upstairs. It’s not as easy to visit as our previous occupations, thanks to the large fence that Southwark has installed around the entire area, and the presence of around twenty security guards to enforce it. However we have ways of sneaking you in. Or chatting with you over the fence if you’d rather not come inside. You can phone us on 0754 680 4591. You can email us on aylesbury(at)riseup.net. Bear in mind that we don’t always have reliable internet access inside the occupation, so can’t always respond straight away.